It’s a telling testament to the famed spirit of the Machine Team that so many of the men who played in those years stayed involved with the club – some at committee level, many others with the Past Players Association – long after their playing days ended. At one stage, in the 1970s, about two-thirds of the surviving team members still remained actively involved with the club and the Past Players – a remarkable percentage. A prime example in this area is Elvin Arnott ‘Snowy’ Barr. He played only nine games at Collingwood but, along with fellow Machine alumni like Bill Sneazwell and Hec Ross, helped form the Past Players Association in 1950. He remained a vice-president of the association into the 1970s. ‘Snowy’ was born in Romsey but moved with his family to Clifton Hill at a young age. He was a rugged, fair-haired left-footer who came to Victoria Park from the seconds in 1930, having previously played with Tooronga. The Sporting Globe described him as “game and dashing … a sturdy, never-say-die type of follower who looks good in either defence or attack”. He won a training trophy from Wal Lee in that first year, and seemed to be making progress. Late in his fourth game, just after he’d kicked two goals to seal the match, he clobbered an opponent (nearly causing a riot as he left the field) and was rubbed out for eight weeks. It was a sign of Jock McHale’s faith in Barr that he was returned to the team immediately his suspension ended, but he couldn’t keep his place for the Grand Final. He didn’t play senior football in 1931, either, but McHale was still optimistic during the 1932 pre-season, telling a reporter that Barr had developed nicely as a follower and defender. But ‘Snowy’ did his shoulder in Round 2 and never regained his place. Still, the real adventures for ‘Snowy’ Barr were just beginning. He played and coached at clubs including Camberwell, Deepdene and Uni Old Boys. He was also involved with Collingwood Under-19s. A ship chandler by profession, with a penchant for hard work, he started his own businesses, then went into hotels in regional Victoria, eventually settling in Birregurra. He and his wife, Eunice, had a daughter, Lois, and later adopted two boys from his wife’s side of the family, whose parents had split. One of those boys, Alan, played 22 games with Geelong in the mid-1960s. 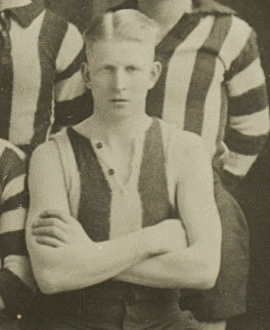 Even when he was at Birregurra, ‘Snowy’ remained committed to Collingwood and regularly travelled to Melbourne for Past Players meetings or to help organise the picnics. Like so many of his former teammates, his brief taste of senior football had sparked a lifelong love affair with the mighty black and white.